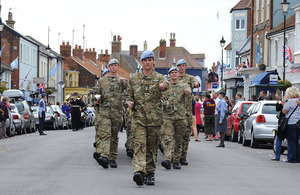 100 Army Air Corps soldiers marched through cheering crowds in Aldeburgh, Suffolk, at the weekend 'with swords drawn, bayonets fixed, drums beating, bands playing and colours flying'. The Freedom of the Town of Aldeburgh was received by 3 Regiment Army Air Corps, which is based at Wattisham and flies the Apache attack helicopter, from Aldeburgh Town Council on Saturday, 23 June 2012. The granting of the freedom deepens relations between Aldeburgh and 3 Regiment Army Air Corps, with the unit’s 653 Squadron having a close affiliation with the town. 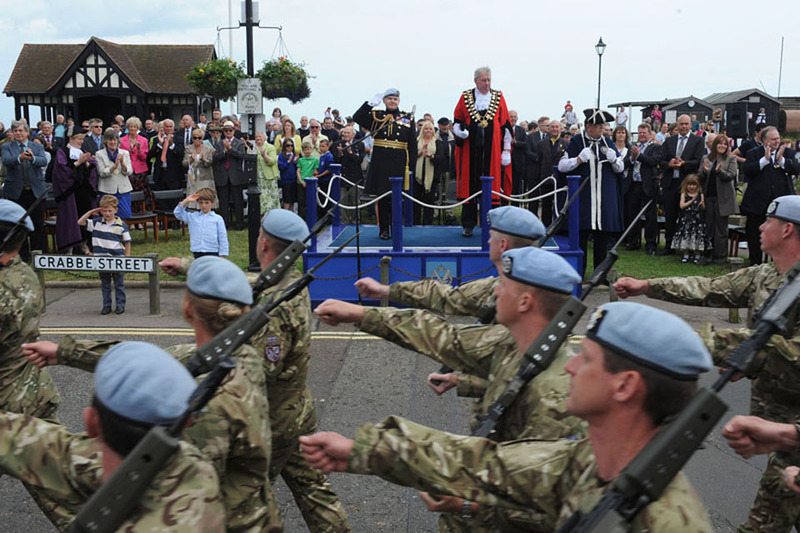 The soldiers, led by the Band of the Parachute Regiment, marched along the High Street to Moot Hall, where the Mayor of Aldeburgh, Councillor Peter Cox, and Lieutenant General Sir Gary Coward took the salute. An Apache flypast followed the presentation of Queen’s Diamond Jubilee Medals and campaign medals earned from the regiment’s deployment to Afghanistan last year. The parade was a great opportunity to give something back to the people of Aldeburgh in recognition of the support they have provided to the regiment, in particular to 653 Squadron which is celebrating its 70th anniversary this year. We are delighted to grant the Freedom of Aldeburgh to 3 Regiment Army Air Corps as a formal recognition of the strong links between the town and the unit. We have enjoyed a close affiliation with 653 Squadron since the unit moved to Suffolk 20 years ago and look forward to maintaining that relationship into the future. Wattisham Flying Station is the home of the British Army’s Apache attack helicopter. The Apache is flown on operations by 3 and 4 Regiments Army Air Corps, with the two units providing a continuous presence in Afghanistan since 2006 on rotation. Second line maintenance on operations is provided by 7 Air Assault Battalion Royal Electrical and Mechanical Engineers. All three units are based at Wattisham and form part of 16 Air Assault Brigade, which is the Army’s rapid reaction force and combines the Apache’s potency with the speed and agility of airborne and air assault forces. 3 Regiment Army Air Corps was responsible for operating the Apache in Afghanistan from January 2011 to January 2012, with its three squadrons each deploying on a four-month tour. The unit will be returning to Afghanistan this September.